I'd like to thank the Wall Street Journal for featuring my soap dispenser picture in the Dec. 19th, 2012 edition. 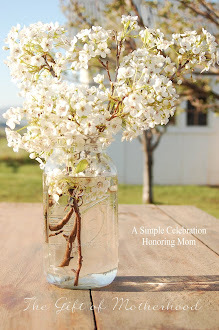 The article entailed lots of fun and creative uses for Ball canning jars. When Barbara, the photo editor, emailed me I was so very flattered! Even better...our small town sells the Wall Street Journal. You can read the whole article online if you have a subscription HERE. If you'd like to make your own dispenser, you can view the post HERE. This is so cool! How exciting for you. I was pretty excited when my Christmas Advent book was mentioned in Deseret News out of Utah. WOW, Julie! How fun and exciting! Congrats. I made one of your jars when you first posted it. It not only works great,but looks good too. Congratulations! You must be so proud that the Lord gave you such a creative idea :O) I have been desperately searching every antique store I can get into for an antique quart Atlas with a lid. When I finally get one, I'll be making your little lovely too. Have a blessed new year. Congratulations! You are so creative, and your canning jar idea and picture is just beautiful. And I'm so glad I saw this post. When we moved into our new home, a lady gave me a beautiful soap dispenser for the kitchen sink. I dropped it while filling and accidentally broke it. :( I decided to make one from a canning jar like yours, but the hole in the lid isn't the right size for the pump I ordered (never thought of using one from a lotion bottle). Anyway, you've solved my problem because now I know that I can use glue instead of the plastic piece which screws to the pump from the underside. Thanks! Congratulations Julia!!! That is sooo exciting! I'm so happy for you! What a neat honor! How exciting for you and I'm dying to make one of these! Congrats! It was actually that post that landed you on my favorites list! Both my SIL and myself followed the tutorial and created one for our kitchen sink. Once again congrats and Happy New Year! Just pinned. I assume you have the source for your lovely tops in the post? What exciting news, Julia! Congratulations... I love that post. :-) Happy New Year! WooHoo! How cool is that! The world would be better if newspapers featured LOTS of your blog posts. Congratulations! I used your tutorial earlier this year to make one for my kitchen sink. Julia, How great! I did not even know the Wall Street Journal wrote articles about anything other then business and politics. I love this idea..thank you for it!